I have called this press conference to say a few words. The election campaign of 2011 is over. The people of Zambia have spoken and we must all listen. Some will be happy with what they have heard, others will not. The time now is for maturity, for composure and for compassion. To the victors, I say this: you have the right to celebrate but do so with a magnanimous heart. Enjoy the hour but remember that a term of government is for years. Remember that the next election will judge you also. Treat those who you have vanquished with the respect and humility that you would expect in your own hour of defeat. I know that all Zambians will expect such behaviour and I hope it will be delivered. Speaking for myself and my party, we will accept the results. We are a democratic party and we know no other way. It is not for us to deny the Zambian people. We never rigged, we never cheated, we never knowingly abused state funds. We simply did what we thought was best for Zambia. I hope the next government will act likewise in years to come. Zambia deserves a decent democratic process. Indeed, Zambia must build on her past victories. Our independence was hard won, our democracy secured with blood. Zambia must not go backwards, we must all face the future and go forward as one nation. Not to do so would dishonour our history. To my party, to the MMD candidates who did not win, the lesson is simple. Next time we must try harder. We fought a good campaign. It was disciplined. I still believe we had a good message and we reached every part of the country. We travelled to all nine provinces and we spoke to all Zambians. To those who worked every hour of the day, I say ‘thank you’. You have done your best. But, sadly, sometimes our best is not good enough. Do not be disheartened. The MMD will be back. We must all face the reality that sometimes it is time for change. Since 1991, the MMD has been in power. I believe we have done a good job on behalf of all Zambians. Frederick chiluba led us to a genuine multi-party state and introduced the private sector to our key industries. Zambia was liberated by an MMD ideal but maybe we became complacent with our ideals. Maybe we did not listen, maybe we did not hear. Did we become grey and lacking in ideas? Did we lose momentum? Our duty now is to go away and reflect on any mistakes we may have made and learn from them. If we do not, we do not deserve to contest power again. The Zambia we know today was built by an MMD government. We know our place in history and we know that we can come back to lead again in the future. A new leadership will be chosen, and that leadership will be from the younger generation. My generation -- the generation of the independence struggle -- must now give way to new ideas; ideas for the 21stcentury. From this defeat, a new, younger MMD will be re-born. If I can serve that re-building, then I will. I must thank my cabinet for delivering on our promises. We did a lot of good for Zambia. Many of our projects will blossom into bright flowers. Some of you will be back to serve Zambia again – I know you will do your best for your party and for your country. To the civil servants and government officials, it has been a privilege to serve with you. We have worked many long hours together. We did it not for ourselves but for Zambia. Serve your next masters as you did me, and Zambia will be in good hands. I must thank my family and my wife. They have stood by me and I cannot ask for more loyalty than that which they have displayed. I love you all dearly and I will always be in your debt. Being president is hard work, it takes long hours of work. And because of it, I have not always been there for you. Yet, still you were there for me. Words cannot express the depth of my love for you all. All I ask is that my family continues to serve Zambia as i have sought to do. But my greatest thanks must go to the Zambian people. We may be a small country on the middle of Africa but we are a great nation. Serving you has been a pleasure and an honour. I wish I could have done more, I wish I had more time to give. Our potential is great. Our resources are impressive. I urge you all now to rally behind your new president. Yes, we may have different ideas but we both want the same thing – a better Zambia. Now is not the time for violence and retribution. Now is the time to unite and build tomorrow’s Zambia together. Only by working together can we achieve a more prosperous Zambia. In my years of retirement, I hope to watch Zambia grow. I genuinely want Zambia to flourish. We should all want Zambia to flourish. 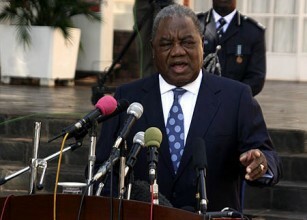 So, I congratulate Michael Sata on his victory. I have no ill feeling in my heart, there is no malice in my words. I wish him well in his years as president. I pray his policies will bear fruit. But now it is time for me to step aside. Now is the time for a new leader. My time is done. It is time for me to say ‘good bye’. May God watch over the Zambian people and may he bless our beautiful nation. Kenya's foreign policy during the Moi and Kibaki eras. Institutional actors in Kenya's foreign policy..
How Did Kenya Find Herself Before The ICC ? Somalia : Is political Instability Healthy for Kenya ?